We’d love your help. Let us know what’s wrong with this preview of Cry Havoc by Jolie Mason. To ask other readers questions about Cry Havoc, please sign up. I couldn't wait to read the latest Jolie Mason Scifi novel! Ever since discovering the amazingly detailed world she's created with her 'Home in the Stars' and '47th Lancers' series, I was excited to see what comes next. Cry Havoc does not disappoint. Full of familiar characters, with the alien menace inherited from earlier books, it takes the collection a step further in developing more the life on Space Station Havoc, and digging deeper into how the AI works in this world. In addition, we get t I couldn't wait to read the latest Jolie Mason Scifi novel! Ever since discovering the amazingly detailed world she's created with her 'Home in the Stars' and '47th Lancers' series, I was excited to see what comes next. Cry Havoc does not disappoint. Full of familiar characters, with the alien menace inherited from earlier books, it takes the collection a step further in developing more the life on Space Station Havoc, and digging deeper into how the AI works in this world. In addition, we get to know more about Aiden, a minor character from earlier books, who grows into a fascinating person in his own right. I was rooting for him from the first page, and my emotions rose and fell with his. As a huge fan of Jolie Mason, I was super excited when I found out that she has a new series. 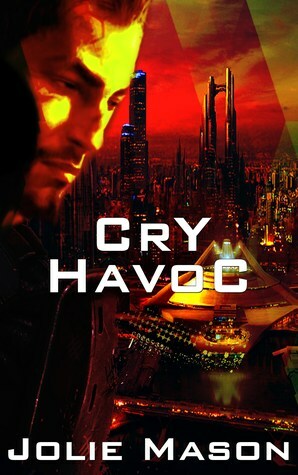 In Cry Havoc, Aiden Simeon is a very young man with a load of responsibilities, not the least of which is the care of his ad hoc family, three orphaned kids for whom he strives to provide. He's working as a tech with the Lancers, a fact which pleases me to no end--I loved Mason's 47th Lancers series, and I'm thrilled that she's brought back some of those characters. Available Kindle Unlimited but must have gotten a review copy/freebie. Dystopian sorta, space opera sorta, interesting read just really hard to explain. Jolie Mason was born and raised in New Madrid County in Swampeast Missouri, and has gone home again, as so many seem to do. She lives there with three kids, one monster dog, and two crazy cats. She's published the complete series Home in the stars, a scifi romance, filled with space adventure and her newest release is the companion series, the 47th Lancers. This group of novellas will follow a mer Jolie Mason was born and raised in New Madrid County in Swampeast Missouri, and has gone home again, as so many seem to do. She lives there with three kids, one monster dog, and two crazy cats. She's published the complete series Home in the stars, a scifi romance, filled with space adventure and her newest release is the companion series, the 47th Lancers. This group of novellas will follow a mercenary company through the upcoming war. Look for War in the stars sometime in the next year.